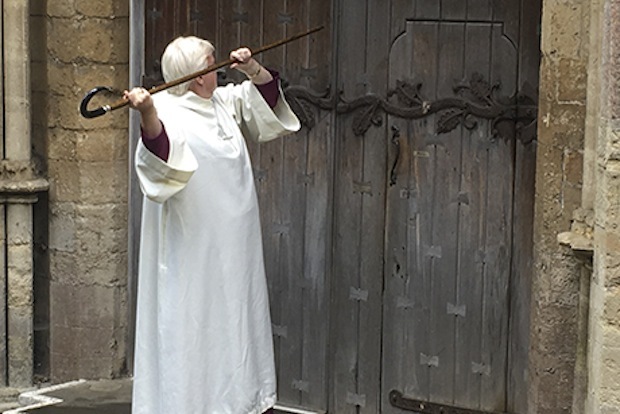 Before the service began, as part of an ancient tradition, Bishop June had to request permission to enter the cathedral by knocking three times with her staff on the west door. She was then welcomed inside by the Dean of Llandaff, Gerwyn Capon. 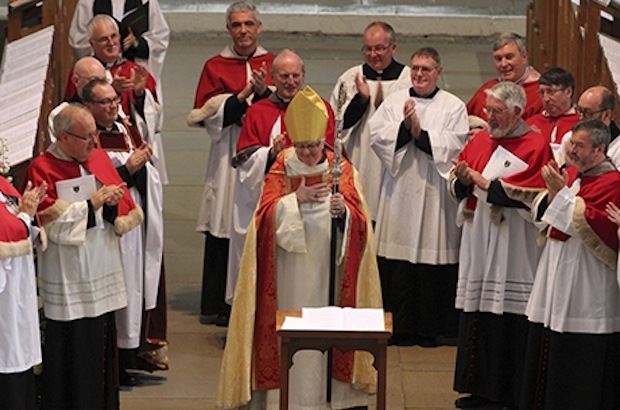 Her mandate to serve as the Bishop of Llandaff was then read out and she took her oath on the cathedral Bible. 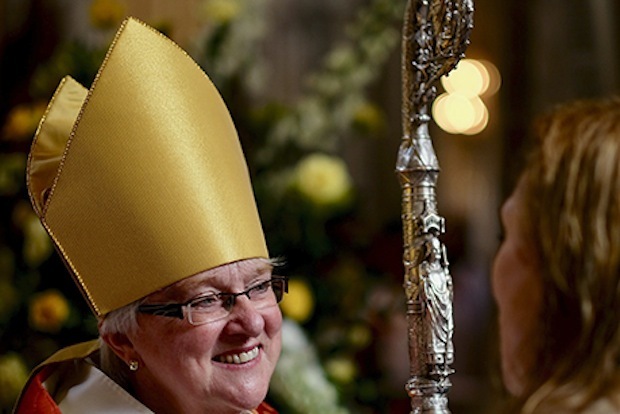 She is Llandaff Diocese’s first woman bishop and the second woman bishop in Wales. During the service Bishop June was anointed with the Oil of Chrism, vested with her cope and mitre and presented with the diocesan staff – the symbol of her authority in the diocese - before being installed in her seat in the cathedral, the Episcopal Throne. She was welcomed with applause by the congregation and greeted the cathedral Chapter and area deans along with civic dignitaries and faith leaders. She also thanked her friends and colleagues and bishops, paying particular tribute to her predecessor Bishop Barry Morgan to whom she said the diocese owed a great debt. 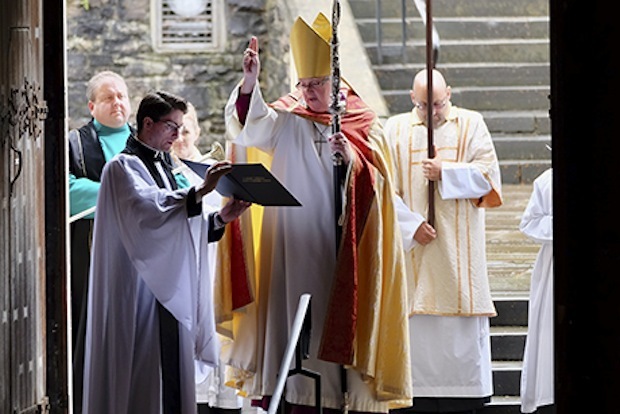 “I step, humbled and delighted, into taking hold of the baton and building on his legacy,” said Bishop June, who blessed the city and the diocese at the end of the service. A ground-breaking figure in the Church of England, Bishop June served as Dean of Salisbury for the past 13 years and was the first female Dean to be appointed to a medieval cathedral, having served as Salisbury Cathedral’s Canon Treasurer for nearly 10 years. 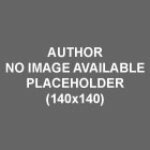 She has been active in the national life of the Church of England, serving for many years on General Synod’s Standing Committee. One of the first women to be ordained as a priest in England in 1994, having been a Deaconess since 1980 and Deacon since 1987, Bishop June’s ministry has been characterised by her passion for equality and diversity and she was a founder of the Church’s Leading Women programme. She is married to barrister Paul Goulding QC and they have two children, Megan and Tom.Her mandate to serve as the Bishop of Llandaff was then read out and she took her oath on the cathedral Bible. She is Llandaff Diocese’s first woman bishop and the second woman bishop in Wales. During the service Bishop June was anointed with the Oil of Chrism, vested with her cope and mitre and presented with the diocesan staff – the symbol of her authority in the diocese - before being installed in her seat in the cathedral, the Episcopal Throne.